With Mother's Day only one week away, I thought it would be fun to share some homemade Mother's Day gift ideas. So if you have any from this year or previous, please link them below. 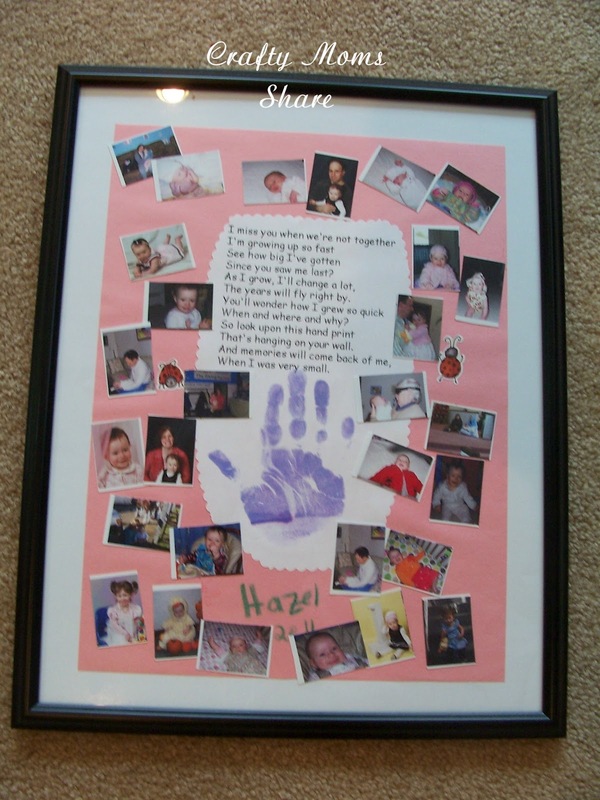 Then have your child(ren) add his/her handprint(s) and we cut it out and backed it on construction paper and then added small pictures of Hazel from birth until the time we made it and of course added her name and the year. For this year's Mother's Day gifts we are using our magnet sunflower photos. (This project also came from DLTK's Kids.) To see how we made them check out here. What are you doing for Mother's Day gifts? Do you end up helping make your own, like I do? Please share your great Mother's Day gift ideas here (past and present)!! I will keep this party open for a couple of weeks so you can share anything your child makes you after the fact as well. Then I guess we can start thinking about Father's Day!! Thanks for sharing!! And please go visit Plain Vanilla Mom's Mother's Day Gifts Made with Love link party and link up there as well. so sorry! Please delete my playdough link. I am obviously not reading this early in the morning! sorry! I love this linky party!! Thank you so much for inviting us! 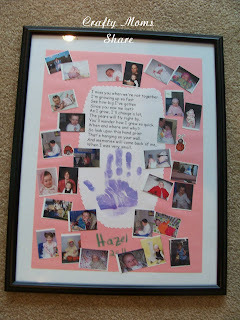 I think I am going to make the same picture frame - I LOVE the idea and the poem!!! Thank you!!! Thanks for hosting this linky party! This was such a great party idea. Thanks so much for hosting. Congrats! This post was my #1 most clicked post in The Mommy Club-Mommy solutions and resources the past week! I really appreciate you taking the time to link up and share. Stop over and see your feature. I can't wait to see what you share this week! I'm following you on Pinterest and gave your post a pin. this idea is amazing. i had to make one as soon as i saw it. thank u for posting such a unique idea. ours turned out beautifully. I think one of the best gift that we could ever give to our mom is our love and affection, and of course, showering them with material gift once in a while is just a bonus. Thanks for sharing inspiration.